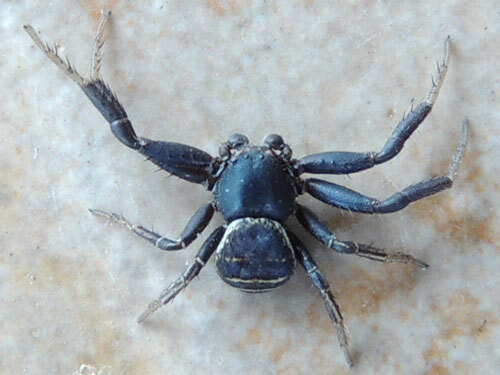 Crawling on a stone walkway in Eldoret, Kenya, December 2012. Body length is about 7mm. Crab Spiders, Thomisidae, are classic sit-and-wait predators. Instead of constructing a snare web they find a place to sit where it is likely that an insect prey will happen by. Many yellow and brightly colored crab spiders sit on flowers where flies and bees are the main target. Bark spiders like the one shown sit on a tree branch, often at a junction, where crawling bugs traverse. The first two pairs of legs are rotated anteriorly and are strengthened for grasping prey. After grabbing a bug, the crab spider delivers a toxic bite that subdues it quickly.